Now that the calorie-heavy holidays are over, I, probably like many Americans, am thinking about healthy eating again. I am saying goodbye to desserts with every meal and hello to healthy foods. Food is just like fashion; there are fads and trends, e.g. kale and juicing. Like my fashion sense, I am mostly oblivious to what foods are “in” or am actively ignoring them, again like kale and juicing. One food craze that I cannot ignore is quinoa. This grain is so delicious and non-offensive. 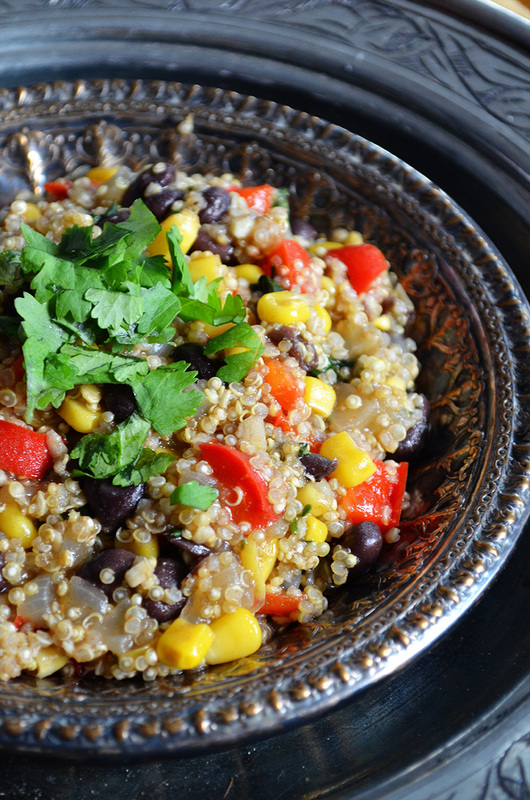 I love cooking with quinoa because it, like the color white, goes with everything! My southwestern quinoa recipe is adapted from the very popular quinoa and black beans recipe on allrecipes.com. I spiced it up by adding roasted red bell peppers to give it another level of delicious southwestern flavor. I love this dish so much, and I can have it by itself for lunch, dinner, or second dinner. No guilt follows because it is very healthy. 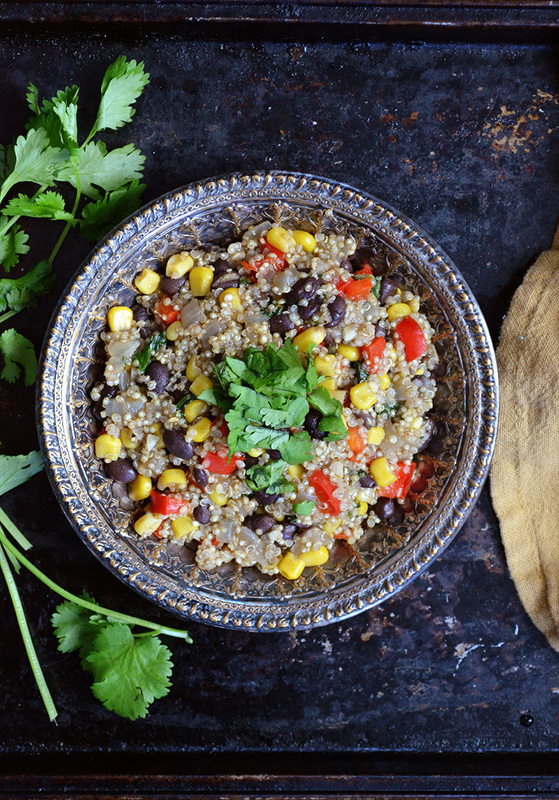 This quinoa recipe is a one pot wonder and takes about 40 minutes from start to finish. A big thank you to Papa Uhlig for my new antique dishes! In a small mixing bowl, toss to combine the diced red bell peppers, 1 tablespoon olive oil, ½ teaspoon salt and ¼ teaspoon freshly ground pepper. Spread out evenly on a baking sheet, then roast for 10 minutes. Set aside. In a dutch oven or medium-size pot, heat up the remaining olive oil over medium heat. Add the onions and garlic and cook for 10 minutes, until soft. Add the quinoa, then stir in the broth. Season with cumin, cayenne pepper, ½ teaspoon salt, and ¼ teaspoon freshly ground black pepper. Bring to a boil, then reduce the heat to low, and simmer until the broth is absorbed, about 15 minutes. Stir in the corn, black beans, roasted red bell peppers, and chopped cilantro, then cook for another 5 minutes. Remove from the heat, garnish with more chopped cilantro (optional), then serve warm. This entry was posted in Entrees, Sides and tagged vegetarian. YES! this is the kind of stuff I should be eating for lunch and dinner these days! Had way too many desserts during the holidays! Looks awesome and I love the clicks! 🙂 Pinning.